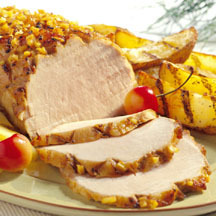 CooksRecipes has quality, kitchen-tested recipes for grilled pork roasts and tenderloins that you can count on for successful deliciousness. 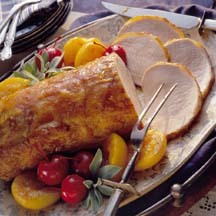 Your grandmother probably made a roast like this, it's a timeless favorite your family will appreciate. 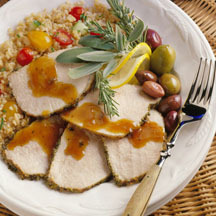 Lemon, fresh rosemary and sage, and copious amounts of cracked black pepper give this grilled pork roast its Mediterranean flavor. Fresh pineapple, honey,soy sauce, garlic, white wine vinegar and fresh ginger...these are the ingredients that make up the marinade and sauce.